Happy New Year. I'm sneaking in a quick blog post between start-of-term business and our impending house-move next weekend (no huge life-dramas: it's just that the land-lady's selling up and we're only moving a mile away, but moving is a hassle). I thought I'd share a recent experience in balling some yarn of my mother's, in case the info is of any use to fellow knitters. 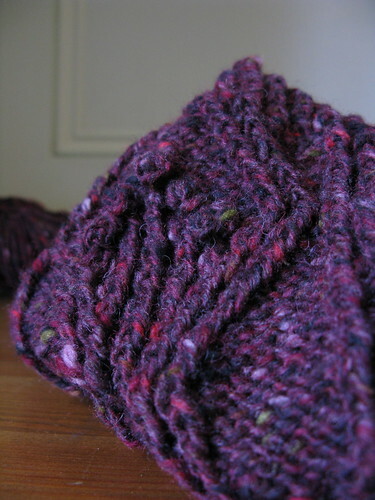 Exhibit one: some pretty, but very tangled and very, very slippery yarn. My mum bought it in Damascus (here). 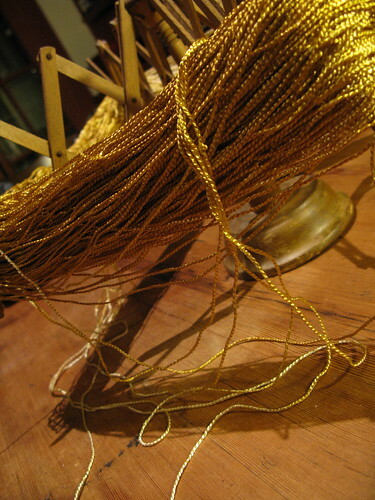 From my own experience with a lace-weight version of the same yarn, I predicted it would be a humongous pain to ball. Loads of tangles, and so slippy you leave it un-gripped for a millisecond and the ball falls to pieces (creating more tangles in the process). I warned her, and insisted she came round to use our swift and ball winder. I was right about the tangles and slipperiness. About 1/8th of the way through we decided to ditch the idea of the ball-winder (it just slipped off it, you had to hold the ball in your hand the whole time...). We needed a bobbin which could readily be passed through un-doing knots. We looked around the table and spotted some rolls of parma violets I had lying around ready to be sent off to a friend who lives in the states. They worked REALLY well. The thick pen-like shape was great for wrapping yarn around whilst keeping tight in your hand, as well as pointing through the knots. 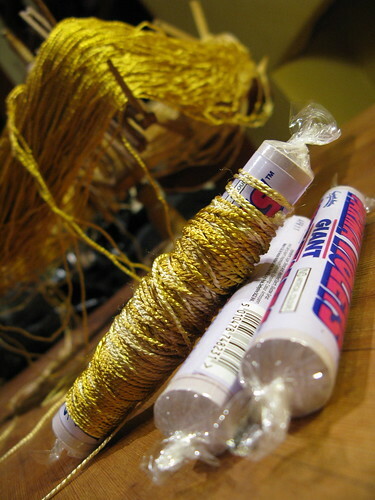 We then balled the yarn (by hand) from these bobbins and kept the balls secure with some tissue paper and rubber bands. It still took several hours: the finished knitting pieces from this yarn better be worth it! If you don't know what these Parma Violets things are, they are UK-sweeties (candy if you really must), flavoured with violets. You either love or hate them. See a close up of the 'bobbin' here. I'll finish with a couple of FO shots - pieces finished over the Christmas break, my last knitting of 2009. It's the Wedgewood blouse from IW Knits Summer 2006 (but modified as a woolly jumper), and a super-simple top-down raglan cardigan. Ravelled here and here respectively. The yarn for both comes from aborted attempts at Demi (rav link). Which, using yarn from a first-day-of-the-sales trip to John Lewis, is my current WIP. I've modified to work it as a top-down raglan, but I'm a little worried I won't have enough yarn. Wish me luck. wow, utterly gorgeous sweaters!! and that yarn is incredible, it does look veeeery slippery. Silk, I assume? Finally! A use for Parma Violets! :-) lovely knitting as always! I reckon that's the best use there could possibly be for parma violets (she spits). Love the wedgwood cardi! Heh, clever use of parma violets (admittedly anything beats eating them...). I love the red cardi and your mods to the Wedgewood blouse look great. Hope third time's a charm for Demi! Nice move with the bobbins! I admit to having similar problems with Malabrigo which is the opposite of slippery, it's dry and sticky. Happy New Year to everbody, I feel so happy with your information because it is so interesting and easy to understand,you have the talent to make some great ppst, congratulations!! Excellent, thanks a lot for share. Wow, what a nice blog you have dear. I am quite amazed of your writing skills. Have bookmarked your site for further reference. That's a brilliant initiative. I would love to try that one also. So, I think next week, I need to gather all the materials needed for that beautiful project.